Whether it's modifying a dozen laptop cases to meet your exact requirements, building fully custom cases to your exact dimensions, or just talking to you and discovering exactly what you need, justCASES provides the solution. Just give us a call (888-318-5878), or go right to this form to get us started on your custom cases. We can provide custom cut foam for your cases and add wheels or casters. Find yourself needing to move a bunch of laptops together? We can modify a case exactly for that. A recent customer needed a dozen identical laptop cases for a training group. We worked with the case manufacturer to create a special one-off design that met her needs exactly. Contact us via email or phone to get started. 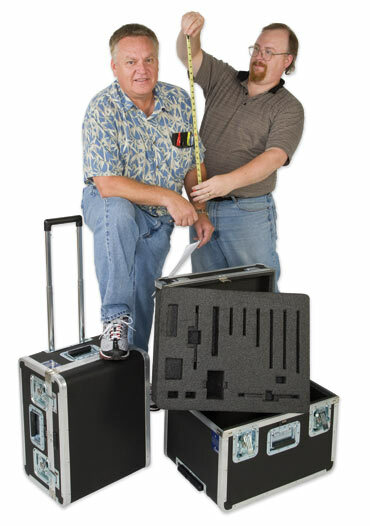 From a company that makes scale models of skyscrapers, to LCD Monitors, to a mobile church-in-a-box, we've worked with customers to create the exact cases they need. Our years of case experience make us the perfect go-to team for your order, no matter how unique. Call us (1.888.318.5878) to get started.